Musical artist JES has had quite a career. Gaining a footing in EDM where she has collaborated with huge name acts such as Tiesto, the songstress has evolved in a new form. 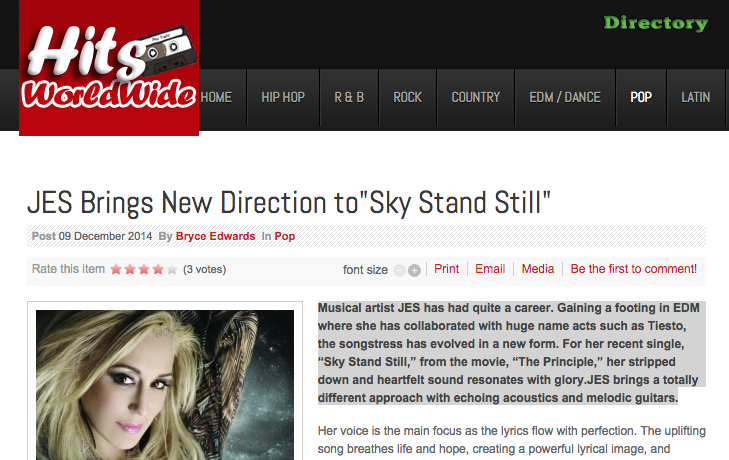 For her recent single, “Sky Stand Still,” from the movie, “The Principle,” her stripped down and heartfelt sound resonates with glory.JES brings a totally different approach with echoing acoustics and melodic guitars. Her voice is the main focus as the lyrics flow with perfection. The uplifting song breathes life and hope, creating a powerful lyrical image, and connects her with a global audience. With the help of film creator Rick Delano, the two collaborated on the stunning song, which serves closely as the theme for the movie. The melodically beautiful tones resonate throughout creating a piece that is not only memorable, but also allows it to stand the test of time. JES’ voice is pure heaven, and it will be interesting to hear what musical path she will choose next.